« BFS Volunteer Days have resumed! Around and into the lake! 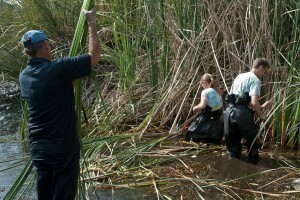 Last Saturday, October 6, was the second volunteer workday for the fall. Part of the volunteer crew worked on clearing the remainder of the trail around pHake Lake, while the rest of the crew worked on cattail removal. 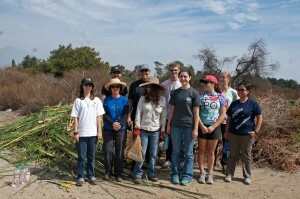 The volunteer crew at the end of the workday with their piles of brush and cattails. Left to right: Anwen Evans, Valerie Evans, Elliot Cox, Tim Cox, Carol Cos, Bryan Visser (HMC ’13), Cleo Stannard (HMC ’15), Alana Springer (Pomona ’14), Anne Clark (HMC ’13) and Maria Morabe (HMC ’13). ©Nancy Hamlett. 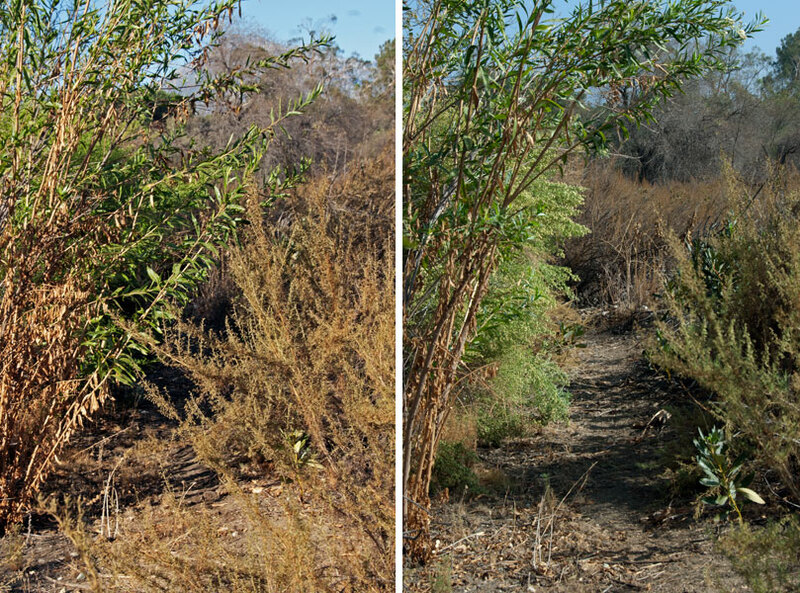 As you can see from these photos, the trail clearing crew was quite successful. The entire trail was cleared, and you can now tell there’s actually a trail there! The the trail on the east side of pHake Lake. 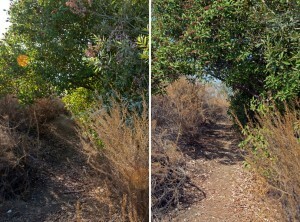 Left: Before clearing. Right: After clearing. ©Nancy Hamlett. 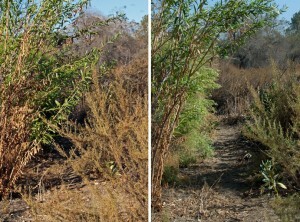 The trail on the south side of pHake Lake. 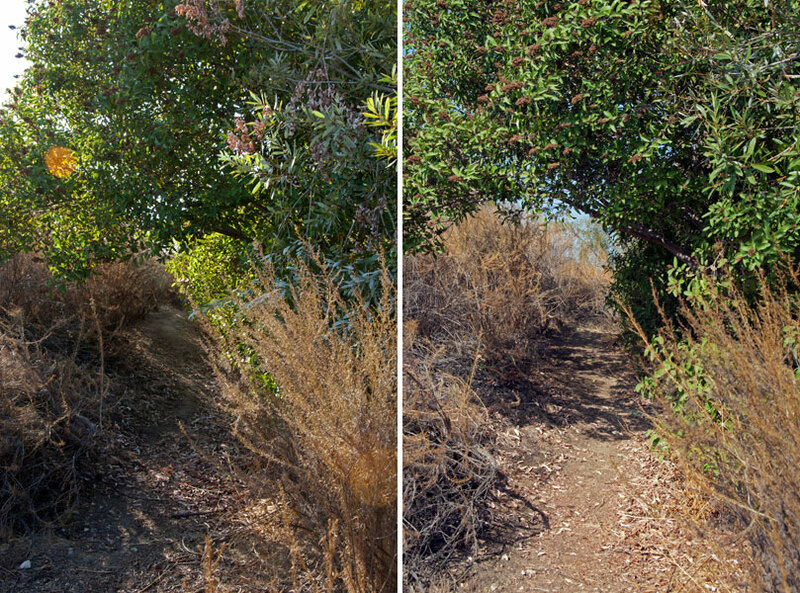 Left: Before clearing. 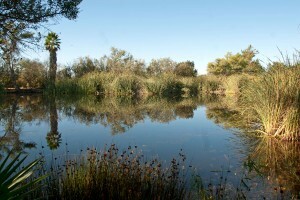 Right: After clearing. ©Nancy Hamlett. The rest of the volunteer crew got into pHake Lake to remove cattails (Typha latifolia) that had encroached on the boat landing area and the viewing point on the little island. 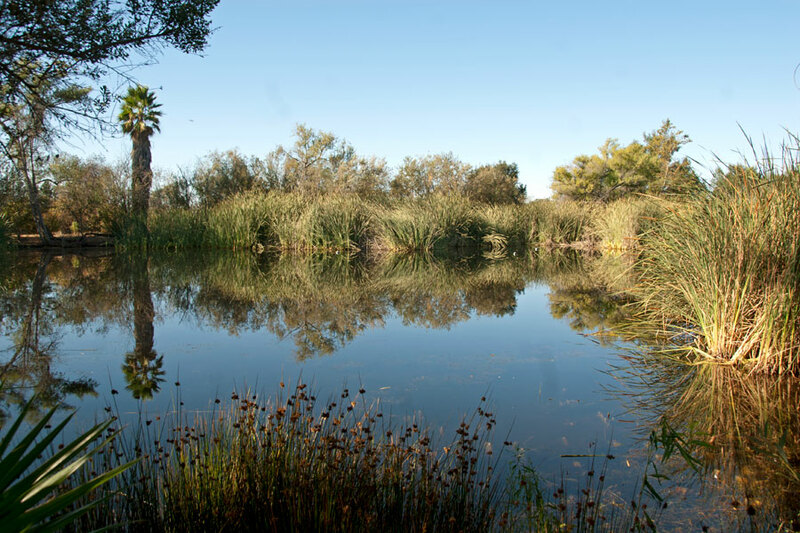 They cut the cattails below the water line to to deprive the roots of their food source and thus reduce the amount of reserves they store in the roots and rhizomes over the winter, and repeated cutting will prevent the cattails from growing back. 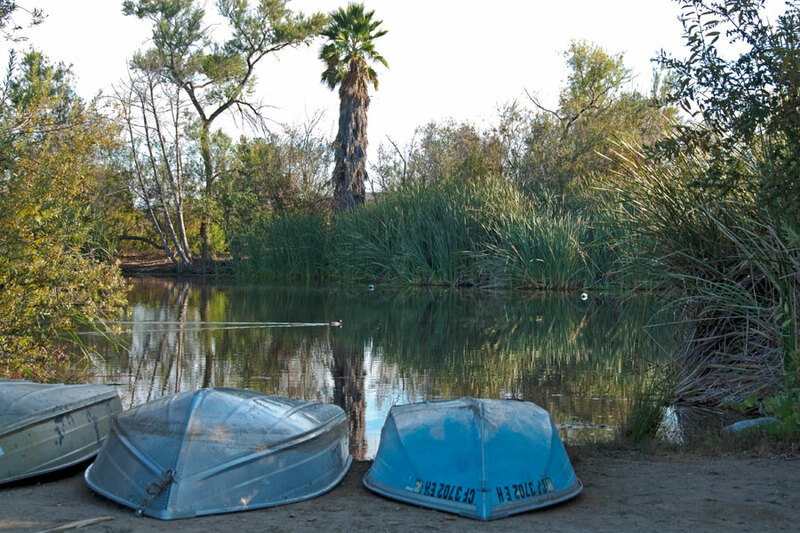 To reach the cattails, volunteers either rowed out in boats or donned waders or dry suits. 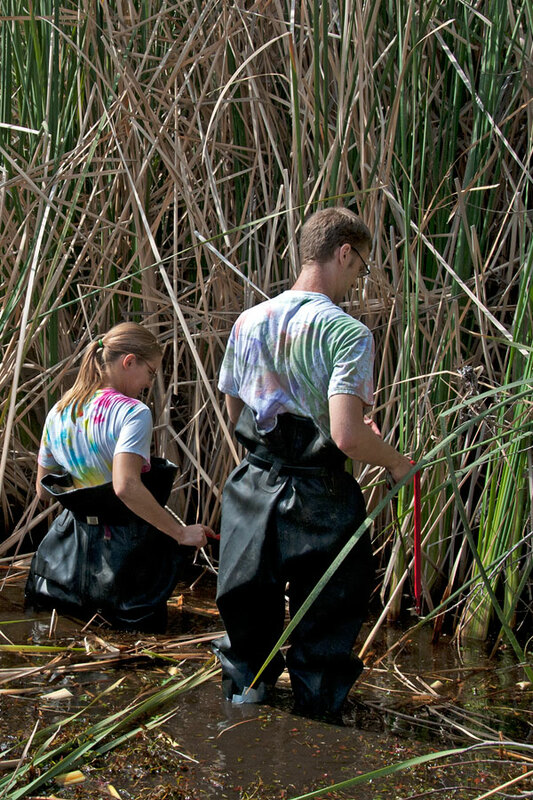 Anne Clark (HMC ’13) and Bryan Visser (HMC ’13) cut cut cattails while attired in these very attractive waders! ©Nancy Hamlett. 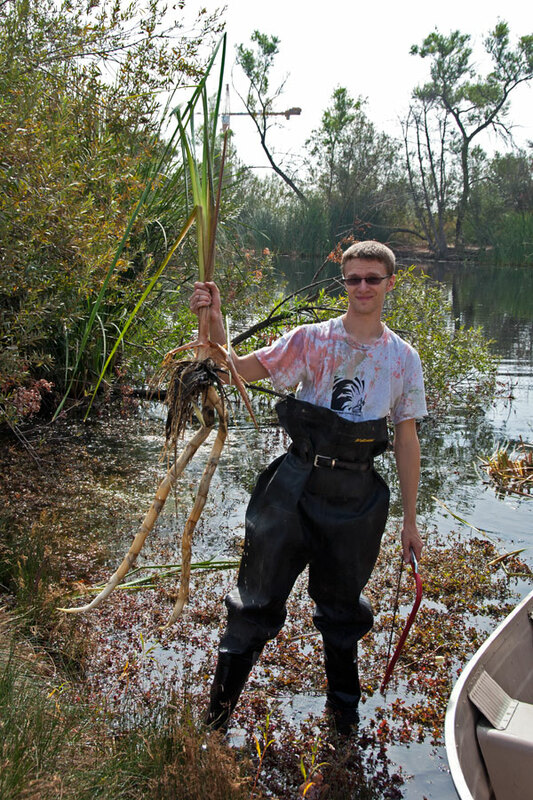 Tim Cox hauls out cut cattails while Anne Clark (HMC ’13) and Bryan Visser (HMC ’13) cut more. ©Nancy Hamlett. Cattails have tough, stout rhizomes (underground stems) that grow just below the soil surface and support the plants, store carbohydrates, and allow the plants to reproduce asexually. According to the USDA, lateral rhizomes have been reported up to 28 inches long, with diameters of 0.2 to 1.2 inches. Judging from the pHake Lake cattails, this may be an underestimate! 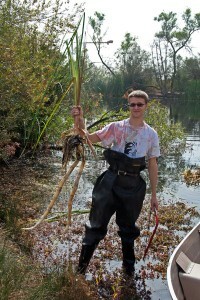 Bryan Visser (HMC ’13) shows off the impressive rhizomes on a cattail plant. ©Nancy Hamlett. View from the little island after cattail removal. ©Nancy Hamlett. The boat landing area with many fewer cattails and one less fallen willow tree! ©Nancy Hamlett. 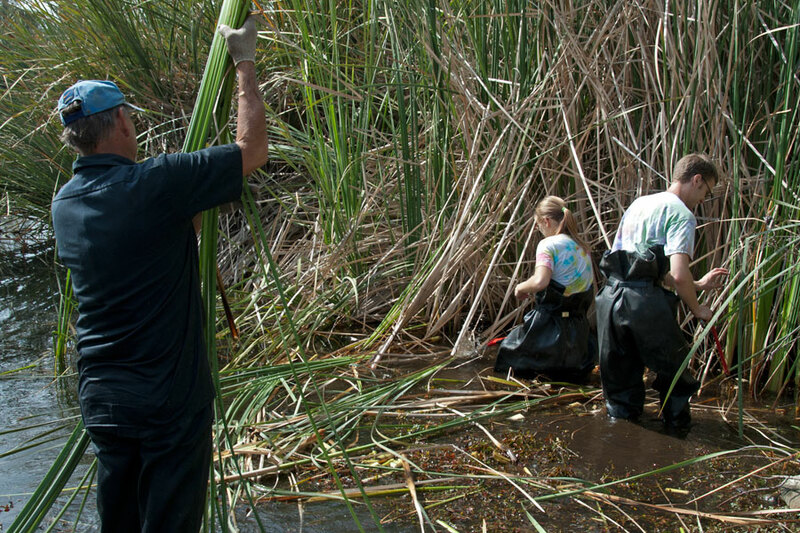 We hope you’ll join us for the next volunteer workday on October 20! 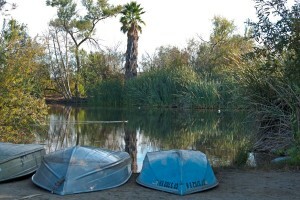 Check our Volunteer web page (http://bfs.claremont.edu/volunteer.html) or our Events on Facebook (http://www.facebook.com/BernardFieldStation/events) for details!